One year down, forever to go! 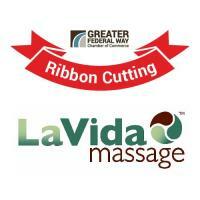 Join the Chamber and LaVida Massage for a Ribbon Cutting ceremony to celebrate their one year anniversary! Meet with the new owners and connect with other business professionals while touring the facility and enjoying light apps and drinks. Free 15 minunte massages for attendees! LaVida Massage of Federal Way, promotes personal well-being in an elegant, yet casual atmosphere where certified massage therapists are experienced in customizing treatments to your specific needs.